There are so many tasty meals to be made from winter vegetables, chickpeas and pulses. Not only are these ingredients nutritious but they are also inexpensive to use when feeding a hungry family. Root vegetables are basically roots of plants that are edible. In other words root vegetables grown under the ground. Popular examples of root vegetables include potatoes, carrots, parsnips and turnips. Root vegetables used to be more seasonable with many varieties being able available in the autumn and winter but with today’s farmers and nurserymen being able to use year round growing techniques these foods are quite often seen on our shop shelves at other times of the year. Everyone enjoys roast potatoes but it is possible to roast most root vegetables easily. To do this clean and chop vegetables into even sized pieces so that they cook evenly. For harder vegetables such as swede part boil them so that it does not take so long for them to cook. Add the vegetables to a baking tray, sprinkle with olive oil and add chopped garlic and herbs for flavouring and roast in the middle of a hot oven turning occasionally until cooked. Balsamic vinegar is a tasty additive to this recipe. To brighten up this dish try adding chopped red onions peppers and other Mediterranean vegetables for variety. Root vegetables can also be boiled in salted water or steamed before eating. Try to retain the skins of these vegetables rather than peeling them as many of the vitamins are just under the skins. By washing or scrubbing the outside of the vegetables and removing any small blemishes the vegetables are then ready for cooking. 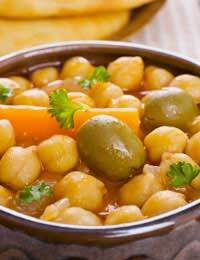 Chickpeas may be new to many people who may have first encountered them in Indian take away foods. Chickpeas can be purchased in cans and are found in the vegetable section or dried alongside pulses, pasta and rice in most stores. Some dried varieties may need soaking before use so ensure that you read the instructions carefully. Chickpeas can be added to casseroles, stews, curries and other recipes to add variety to many meals. Pulses are rich in protein, carbohydrates and fibre and have long been associated with vegetarian meals as meat replacements. However, pulses are now considered a staple part of anyone’s diet regardless of whether they are meat eaters or not. Some pulses bought in dried form are known to hold toxins that must be removed before cooking. Red kidney beans are one example and must be soaked for eight hours before use. By using the canned varieties of pulses you will eliminate the need for soaking. Lentils, root vegetables and chickpeas can be used in curries and casseroles for tasty meals. They will bulk up a meat recipe to make it go further or replace meat to make a cheaper meal. Always keep a few cans of chickpeas and lentil mixes in your store cupboard along with curry powder, chilli powder, onion seeds and other spices as well as frozen root vegetables in your freezer and you will have all the ingredients for tasty meals that can be made at a moments notice.